In 1860, biographer James Parton concluded that Andrew Jackson was “a most law-defying, law obeying citizen.” Such a statement is obviously contradictory. Yet it accurately captures the essence of the famous, or infamous, Jackson. Without question, the seventh president was a man of contradictions. To this day, historians have been unable to arrive at accepted conclusions about his character or impact on the nation. Was he, as Robert Remini has argued across the pages of more than a dozen books, the great leader and symbol of a burgeoning mass democracy? Or was Jackson merely a vainglorious bully with no vision for the nation, reacting in response to his own sensitive pride, as Andrew Burstein and others have insisted? There is much that one can look at in Jackson’s life when attempting to arrive at conclusions. In particular, his relationship with the law and Constitution offer a significant window into his worldview. Whether it was illegally declaring martial law in New Orleans, invading Spanish Florida and executing British citizens, removing federal deposits from the Bank of the United States, or questioning the Supreme Court’s authority in Worcester v. Georgia, Jackson acted in a manner that was at times distinctly illegal yet widely hailed by supporters as being in the nation’s best interest. And before we conclude that this support was partisan banter bestowed by his own Democratic Party, we must remember that historians and legal scholars to this day have wrestled with the larger ideological and constitutional meaning of Jackson’s beliefs and actions. One thing is certain: Jackson had no qualms about overstepping the law, even the Constitution, when he believed that the very survival of the nation required it. Moreover, this perspective remains at the heart of debate in a post-9/11 America. The essential question stands—can a leader violate the law in order to ultimately save it and the nation? Andrew Jackson’s fame came with the Battle of New Orleans in 1814 and 1815, where he demolished a seasoned British army with virtually no loss to his troops. The victory launched the general to national stardom and ultimately the presidency. Yet there were looming, constitutionally delicate issues that roiled beneath the surface of this victory, namely Jackson’s suspension of the writ of habeas corpus and declaration of martial law. The first was authorized by the Constitution, but the Supreme Court had determined that only Congress could suspend the privilege of the writ, which allowed a judge to “bring a body” before the court thus making it impossible for an arresting authority (the police or military) to hold a person indefinitely without filing charges. Jackson suspended the writ anyway, and went even further by imposing martial law, which canceled all civilian authority and placed the military in control. The act was wholly illegal. There existed no provision in the Constitution authorizing such an edict. The rub was that martial law saved New Orleans and the victory itself saved the nation’s pride. After several years of dismal military encounters during the War of 1812 and the burning of the nation’s capitol to the ground in the summer of 1814, no one, especially President Madison, was in the mood to investigate, let alone chastise, the victorious General Jackson’s illegal conduct. Thus Jackson walked away from the event with two abiding convictions: one, that victory and the nationalism generated by it protected his actions, even if illegal; and two, that he could do what he wanted if he deemed it in the nation’s best interest. Jackson’s convictions came into play only three years later in 1818, when the indomitable general exceeded his orders to protect the Georgia frontier by crossing into Spanish Florida, where he invaded two towns and executed two British citizens for making war on the United States. Once again, Jackson’s actions were questionable, if not outright illegal. He essentially made war on Spain without congressional approval, overstepped his own boundaries as a commander, and summarily executed two men, which could very well have incited legal and military difficulties with Great Britain and Spain. However, Jackson’s conduct was once again seen by many, including himself, as a necessary defense of the nation. The Spanish had done nothing to stop the marauding Seminole Indians from crossing the border and attacking American farms. The general’s actions were therefore justified as national self-defense by Secretary of State John Quincy Adams, the sole member of President Monroe’s cabinet to support Jackson. Adams used the turmoil over the incident to convince Spain that they should sell Florida for a measly $5 million. Jackson’s ideological conviction about the flexible nature of the law and Constitution in the face of dangers confronting the still-fledgling nation can be seen in many subsequent Jacksonian battles. When President Jackson confronted the Bank of the United States in 1832, he did so with the belief that it was a corrupt fiscal monster threatening the nation’s economic security. He not only vetoed the Bank’s recharter, which was within his right as chief executive, but went a step further by removing federal deposits even after Congress had deemed them safe. 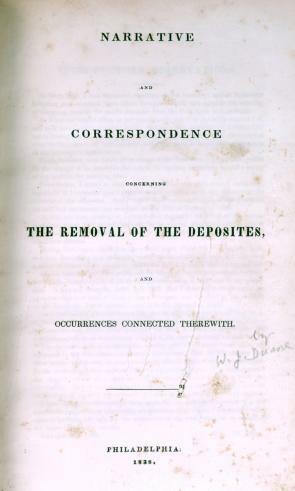 Jackson transferred one secretary of the treasury and fired another in order to secure the deposit removals. His actions were questionable, if not completely illegal, and the Senate censured him by making a notation in their journal. They didn’t attempt impeachment for lack of support. Other legal conflicts surfaced. Jackson allegedly defied the Supreme Court over Worcester v. Georgia (1832), announcing, “John Marshall has made his decision now let him enforce it.” The case revolved around Georgia’s attempt to apply state laws to Cherokee lands. The Court had ruled against Georgia’s authority to do so and Jackson, dedicated to Indian removal, allegedly challenged Marshall. Although there is little evidence to support the above quotation, it certainly sounds like Jackson. Nonetheless, the case required nothing of Jackson and was ultimately settled out of court. The fact remained, however, that in this case and in McCulloch v. Maryland (1819), when it was ruled that the Bank of the United States was in fact constitutional, Jackson challenged the Court’s authority as the final arbiter. As president, Jackson believed that his authority to deem what was constitutional equaled the Supreme Court’s. Jackson’s views regarding American Indians also challenged the law. Treaties were and continue to be legal agreements among sovereign nations. However, Jackson refused to believe that Native American tribes were sovereign and thus viewed Indian treaties as an absurdity. Ultimately, he forcibly removed a number of tribes, most notoriously the Cherokee, from their homes. The Trail of Tears is one of Jackson’s most infamous legacies. Yet even removal and issues of tribal sovereignty fit within a larger context of Jackson’s convictions regarding national security and state sovereignty. The general’s rise was due to his success as an Indian fighter on the frontier. He always, and to some extent legitimately, viewed American Indians as a serious threat to settlers. As president, Jackson understood the sentiment of southern states and their conception that states could not be erected within sovereign states such as Georgia. All of this, of course, revolved around the larger issue of Native American dispossession and who rightfully owned of the land. This ideological—and to some extent legal—issue remains unresolved. A variety of other incidents in Jackson’s life and career expose the nature of his relationship with the law and Constitution: the fact that he was a lawyer who engaged in dueling; his actions during the Nullification Crisis; and his failure as president to follow federal guidelines concerning mail delivery of abolitionist propaganda. Most fit within his larger conception of duty, honor, and what was necessary for the sanctity of the Union. Jackson’s ideology remains as controversial now as it was in his own time. There are few easy answers. Yet this is what makes Jackson’s views and conduct so relevant today. When presented with Jackson’s history, students invariably split down the middle over whether he was justified in his conduct, regardless of legality. In this sense, Jackson continues to serve as an important source of reflection when considering how America should and should not act when it comes to matters of national security. Matthew Warshauer is a professor of history at Central Connecticut State University and author of Andrew Jackson in Context (2009) and Andrew Jackson and the Politics of Martial Law: Nationalism, Civil Liberties, and Partisanship (2006).